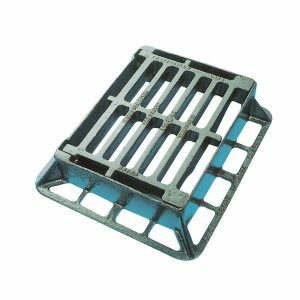 The D400 Heavy Duty Gully Grating is sturdy and reliable. This drain grating is made of ductile iron. With a 40-ton safe test load, this drain grating is ideal for trucks and heavy traffic. This drain grating is HA104/02 compliant. When you need sturdy, reliable drain grating in Barbados, you want the D400 Heavy Duty Gully Grating from Fiberpol. Made with high-quality ductile iron and coated with black bitumen, this manhole-cover-alternative is designed for the ideal weight to strength ratio. This grating is equipped with a caption hinge for added safety.